Tis the season to gain weight. I hate to say that, but it’s the truth. Most Americans will pack on 5 – 10 lbs between Halloween and New Year’s which leaves everyone setting resolutions in January to take it back off. 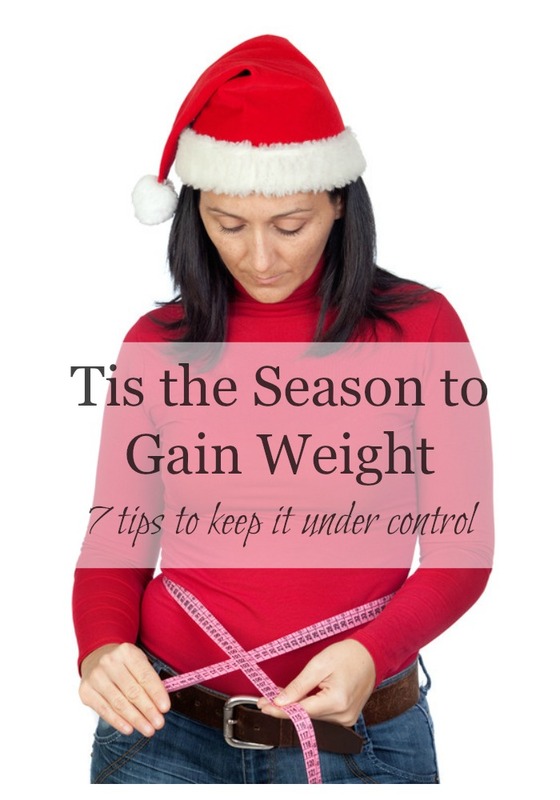 Many get into this mindset that they will just enjoy the holidays and worry about the weight gain a few months from now but it doesn’t have to be that way. In fact if you are strategic about things, you can prevent that weight gain and maybe even lose some weight between now and the New Year. Here’s how. If you want to do this successfully, it has to start with a different mindset. What you need to do first is go into survival mode. Realizing that these next few months will be harder than others to stay on track, Don’t set huge weight loss goals during this time of year. Use the maintain don’t gain mindset. I would also set goals and create tradeoffs for your choices. Being on a diet during the holiday months is no fun and you don’t want to be miserable during such a joyful time of year. I want you to be able to say yes to pie and cocktails but also do this in moderation. 1. Go in with a game plan. If pie is your thing, plan ahead that you will go for one slice of pie. Not three slices. And not pie and cookies and cake and a cocktail. Pick what you love and plan to enjoy it in moderation. Often we find ourselves saying yes to everything when sometimes we don’t even like those things. We just eat them because they are there. It’s extra calories you don’t need and probably don’t even want. 2. Drink water before wine or any alcohol for that matter. Before going to any type of event I always fill up on lots of water beforehand. It helps to keep me full and also helps to flush the alcohol as you drink it. For each drink you have, you should follow it with eight ounces of water. You will find yourself consuming a lot less alcohol. 3. Don’t show up to the party hungry. Or anywhere for that matter. If you do you will find yourself overdoing it at the snack table. Eat before you go if you can. Remember you are there to socialize, not to spend the entire time grazing. 4. Offer to bring a side that is healthy to share with friends and family. This guarantees there will be something healthy to eat while you are visiting. There will always be lots of other great “junk food” options to pick from. You can enjoy those but do it in moderation. 6. Say no to leftovers. I don’t know about you but at the end of most parties the host is always trying to send me home with something. While it’s generous of them it only makes staying on track harder. Politely decline and keep the goodies out of your own house. 7. Plan to get at least 30 minutes of exercise in each day. Even if it’s just a quick walk, it’s important that you are moving. One of the best things that you can do for yourself is to get some fresh air and go outside. It is a beautiful time of year if you get out there and enjoy it. Grab a coat and take in natures beauty. It’s not just good for your physical health, but your mental health as well. Finally, be kind to yourself. It IS a difficult time of year. Do your best. Enjoy your family. Be present in the moment. Don’t stress about stuff, just enjoy. The holidays will be over before you know it. Be sure to PIN to your favorite board! And be sure to subscribe to our email newsletter so you can be the first to read about new and inspiring projects at Pink Fortitude! If you need help with your health and fitness goals please feel free to reach out to me. It would be my pleasure to chat more with you. What about you? What are some of your tips to keep it under control over the holidays? Hi everyone my name is Sarah Griffith. I am a full time health and fitness coach with Beachbody. After two years time and a heck of a lot of work, I have been able to retire from my full time job as a high school business teacher. As a health and fitness coach, I help motivate women to learn how to get healthy and be happier while teaching them how to put themselves first again. Visit me HERE! Thanks for sharing the great tips at the Funtastic Friday linky party! Great tips. I always gain a little weight over the holidays.